Pine Straw Mulch is purchased in baled cubes similar to, but slightly smaller to that of wheat straw or hay bales. This pine straw mulch is produced and baled in the southern states of Georgia, Alabama, South Carolina, and Florida. 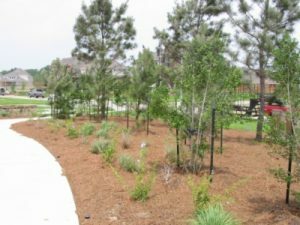 One of the attributes of this type of mulch is that of it’s medium to light brown color along with it’s long stranded needle texture that is often a great contrast to other mulch textures or lawns especially when used in large mulched areas.